Let’s say that you’re the mayor of a big city that’s growing rapidly. Traffic jams last the entire day. Tempers fray and drivers become more and more aggressive. People ignore traffic laws. Pedestrians cross the streets whenever and wherever. Accidents happen constantly. Police can’t keep track of the chaos. You’ve tried cracking down with more police writing more traffic tickets. That only makes the drivers angrier. Traffic is constantly tangled. The air is increasingly polluted. Your popularity is plummeting. You need a persuasion strategy to convince drivers to play fair and obey the rules. What to do? 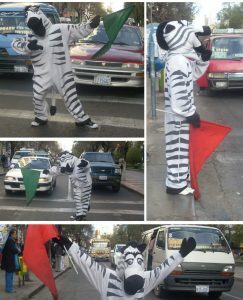 Each day in La Paz, roughly 400 to 500 young people dressed in zebra costumes disperse through the city to guide and direct traffic. But they’re not traffic cops. They’re not there to enforce the rules. They’re behavior modifiers. Ultimately, they hope to persuade people to behave – and drive — better. A similar program in Bogotá, Colombia inspired the zebra program in La Paz. The Bogotá program, which used mimes rather than zebras, began in the early 1990s and claimed to have reduced traffic fatalities by as much as 50%. I haven’t seen similar statistics for La Paz but it’s a fair bet that the zebras have calmed and smoothed and enhanced traffic in a traditionally tumultuous city. Think about it. Wouldn’t you drive more safely if zebras were around?